Hi, this is Kim with Kim Sherrod Studio. I have been sewing since I was a teenager and love to create handmade gifts for my friends and family. As my children have gotten older I now have more time to do what I love! Bonus entry: Click on over to Kim’s blog and become a follower. Then, come back to THIS POST and leave a comment saying that you did! My philosophy is one can never have too many bags or purses! Cute bag! I am a follower of Kim's site also now! That is a cute bag! Wow! Kim has a cute site! I'm a follower now, too! Thanks! the bag is so pretty! thanks for hosting the giveaway. Can you ever have too many tote bags? Maybe…but I'm nowhere near that point. love it! you are almost as talented as Vera Bradley!!! Wow! That is so cute! Love it! I hope I win one of these giveaways. Love this bag. Pretty tote…one can never have too many! im following kims blog too! How Cute! I would love to have it! Love the tote. Very cute. I am a follower of Kim's blog. Very nice! I like the muted tones. Very cute bag. I likey. I am now a follower of Kim's blog. Very cute bag! I really like the paisley fabric. my boyfriend would give me the look…do you really need another bag love it!! I'd prob use this for a diaper bag.,..i really hate the one i have now, and I'm always on the lookout for "the one"
OMG love that bag! I would love to win then hire her to make me a matching wallet and phone case! Love the bag. It's so elegant. You can never have too many totes…very cute! I'm now a follower of you blog! Oh, that is adorable! I could use another purse…who couldn't? now a blog follower too!! I follow-what a great blog:) Lots of fun projects and pics!!! I could always use another cute bag! Love the bag! What a generous giveaway! I would love this for a church bag. What a super cute bag! I love it! This is such a nice bag. Thanks for the chance to win it. This is a cute bag! Love the bag! I would love to win it! I love a good bag. Super Sweet. This bag is soooo cute. I'd love to win! LOVE the bag! So much! I got a sewing machine for my birthday last month and haven't done anything with it yet because I don't have anywhere to put it right now. Besides that I have no idea how to use it yet. Haha! I like the colors of this bag! I am now following kims blog. Some great stuff on there. Hoping I can enter from the UK!! Ohhhh now I really like this bag… I was just looking at the one I carry saying "I need a new purse" and I would feel privilaged to carry this one thank you. By the way Kim I am a follower and your blog is wonderful. I have signed up to follow Kim's Blog – thanks! Cute bag! Would look great with my arm through those handles! You can always use another bag! 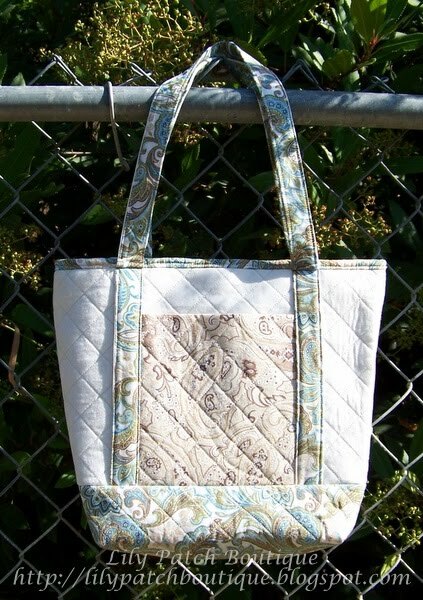 I like the elegant and understated colors in this bag! Great bag! Oh, lovely fabrics! I'd love to win that bag! Oh how I love paisley. This would be an awesome church bag! How stinking cute!! Tote bags = <3!! Lovely bag, it looks well sewn too. Very cute bag. I would love to win. Love the bag, would love to win it too! I'm a follower of Kim's blog now too. I love it!! I need a new bag!! oooo so pretty! like it a lot! Ahh, can never have too many tote bags. Especially ones this pretty! Cute bag! Thanks for the giveaway. I can't sew and that bag is too cute! that is a great bag and I'd love to win it! This is so beautiful, I would love to keep my current crochet project in it for when I'm out and about, or use it for church!! Oh and I also went to your blog and became a follower!! cute bag, thanks for sharing. I gotta win of these giveaways, right. I really need a new diaper bag!!! I am a 'follower' of your amazing blog! Super Cute bag! You are very talented! I would love this to carry all of my kids' stuff around! Love the bag – hope to win. Love the bag. My embroidery would go good in this tote. love the design! Thanks for the chance to win. What a pretty bag! I would love to carry it around. That is a darling bag. Love this! I love having purses that not everyone else out there is carrying. This would be fantastic to add to the collection! I just became a follower of Kim's blog. She is so talented. Can you ever have enough bags?!! Just love it! I sew…but am intimidated by making bags! But I'd love to have this one! That's a really cute bag! Way cute bag! I'd love to win this!